The secret of immortality revealed? Find out in "Torchwood: Web of Lies", a unique 10 part companion to the new Russell T Davies series "Torchwood: Miracle Day." This completely original episodic interactive experience fuses together incredible motion comic graphics and gameplay to tell a digital-exclusive Torchwood story. Players participate in a parallel narrative to the "Torchwood: Miracle Day" that delves deeper into the dramatic events which unfold in the TV series. 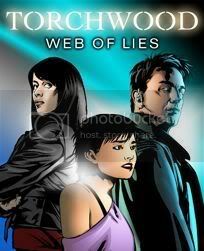 "Torchwood: Web of Lies" includes lead characters Captain Jack Harkness and Gwen Cooper – voiced by John Barrowman and Eve Myles – AND introduces Eliza Dushku as the voice of Holly, a young woman intent on finding out what has happened to her brother and the world. What happened to Jack and Gwen on that "missing day" back in 2007 - the day that neither remembers? Is it possible that a young, paranoid conspiracy theorist actually stumbled into the chilling truth and what it means for Miracle Day? The ONLY place to find out is in "Torchwood: Web of Lies." This application is made by BBC Worldwide. BBC Worldwide is a commercial company that is owned by the BBC. The profits BBC Worldwide make from it go back to BBC programme-makers to help fund great new BBC programmes. Episode 1 of Torchwood: Miracle Day, The New World, premieres on Friday 8th July on Starz at 10pm ET/PT. You can find the full schedule, including repeats at This Week In Doctor Who.